Please see below for urn capacity. 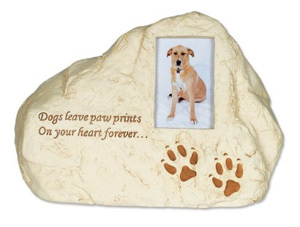 Rock shaped resin dog cremation urn that can be personalised with your pet's photo. This Rock Pet Urn for dogs is made from cold cast polyresin finished by hand using non-toxic paint. 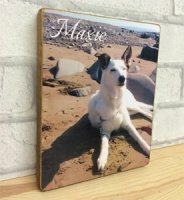 It can be personalised by sliding a photo into the 5cm x 6cm frame on the front of the 'rock'. 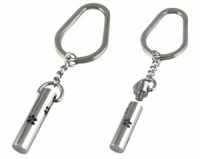 Suitable for outside use - just ensure the photo is weatherproof. Accessible from the bottom, secured by a screw-on lid. 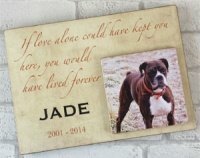 Size: 8" x 5.6" x 5.6"
Capacity: 46 cubic inches - suitable for ashes remains of a pet body weight approx 46 lbs or 23kg (suitable for small/medium dogs or as a keepsake for larger pets). Absolutely delighted. 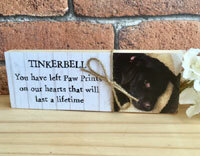 Perfect keepsake for my much loved dog. Excellent service and very happy. Exactly what we wanted and the service was excellent. We were happy with the service and the product. Fitting tribute to our pets who are sadly no longer with us. A beautiful way to remember your faithful friend, very tasteful and looks lovely in the garden. Being able to put a photo on the front makes it look even more special.